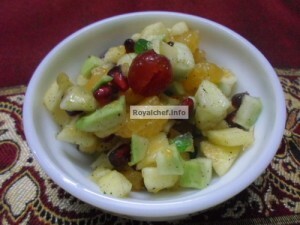 This is a Recipe for Mixed Fruit Chat Salad, a simple Indian Salad, tailored to suit Indian Taste. Once you collect all the ingredients, all that you need to do is to mix and refrigerate them. The recipe in the Marathi language is given below, for the benefit of Maharashtrian readers. Mix all ingredients and keep in refrigerator. 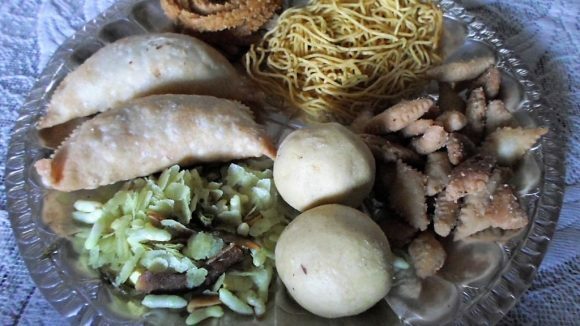 कृती : सर्व साहित्य मिक्स करून फ्रीजमध्ये थंड करून काचेच्या बाऊल मध्ये सर्व्ह करा.